I’m sure doctors will give plenty advice on the skills that are most important (i.e., see here). But what advice can I give them? I’m not a doctor. I could give them some examples of “how not to behave”, but I’m sure that will be covered well by fellow patients, and probably also by blogging nurses (i.e. see the perfect Intern Survival Guide by Mother Jones RN). So I will stay with my expertise: searching. And to make it workable, I will restrict myself to PubMed, the platform that offers free access to 18 million citations from MEDLINE and other life science journals. 18 million, that is a tremendous amount of literature! And that is one of the main problems: the sheer amount makes it very difficult to “pick the needle from the haystack”. Of course, literature searching is not a primary skill for doctors. It is far more important that a doctor is knowledgeable, handy, and a good communicator (!). But at one time or another, he/she has to look things up or wants to check whether current practice is the best way. Or at the very least, doctors have to stay on top of the best and latest information. And that’s when they need to search for medical information. Below are some tips for beginning as well as more advanced PubMed searchers. Obviously, these are only tips, this post is no tutorial and I give but a few elaborate examples. However, I plan to show entire searches in future posts. Perhaps you can help me by sending in examples or asking questions/propose cases. Tip 1 : Look before you leap. Before even thinking of going to the PubMed site, consider whether this is the most obvious source to begin with. First decide whether you have a back- or a foreground question. A background question asks for general knowledge and/or “facts” (questions often starting with who, what, when, why, which). “How can one diagnose appendicitis?” “Which treatments are available for advanced prostate cancer?” These questions can be best answered by textbooks, handbooks and certain databases. UpToDate is usually perfect for these kind of questions. A question like “Which dose of drug X should I prescribe to a woman of 65 kg with disease Y.” looks very specific, but can generally be looked up in a Pharmacopeia (“general knowledge”). Some subjects are covered by in-house protocols or specialist guidelines. 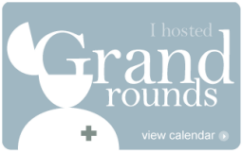 When you have a foreground question it is often better (especially for those “new” to the subject) to search evidence in aggregate or pre-filtered resources, like National Guideline Clearinghouse, the TRIP-database and/or the Cochrane Library. This will save you time, because it lowers the number needed to read: individual studies have been sought, selected, appraised and summarized for you. Besides PubMed there are also so called 3rd party Pubmed/MEDLINE tools, which can be handy for certain questions or approaches. I’m in the middle of writing about these tools, so keep in touch. Meanwhile you may want to read an excellent overview of many of these tools and more on the blog of Mike Cadogan: Medical search for physicians. Earlier I also wrote about the handy use of PubReminer and GoPubMed to analyze text words and MeSH-terms. Although very useful and intuitive, most of these 3rd party PubMed tools don’t have the power of PubMed and are not suitable for elaborate searches. Tip 2: A review article from PubMed. PubMed can be useful for quickly finding good reviews. Type acute pancreatitis in the search bar (pancreatitis may be ‘safer’, but will yield more results). So you search for acute pancreatitis in the title of review articles in core (English) clinical Journals. There are just 28 results in the last 5 years, including reviews in the Lancet and NEJM. In most patients, acute pancreatitis is caused by gallstone obstruction or alcohol, and no genetic testing is needed. However, unexplained recurrent acute pancreatitis might be associated with known genetic mutations in the cationic trypsinogen gene protease serine 1 (PRSS1), SPINK1, or CFTR. Mutations in the PRSS1 gene are seen in most patients with hereditary pancreatitis. In the most frequent mutations, the function of trypsinogen is increased, causing premature enzyme activation and autolysis of acinar cells. Note that I didn’t limit on age and I didn’t add recurrent to the search, as I’m looking for a review that may discuss many forms of this disease in all age categories. Recurrent or young adult may not be mentioned in the abstract (nor in the MeSH), so I may miss important overviews if I add these terms to my search. If you get to many hits, you may always narrow the search later. A similar approach has been used by drW to search for review articles on heparin induced thrombocytopenia (part 1 and 2). UpToDate is a good source as well, ..and clinical experience. Ves Dimov responded on Twitter that he had described a similar hereditary pancreatitis case on his blog. 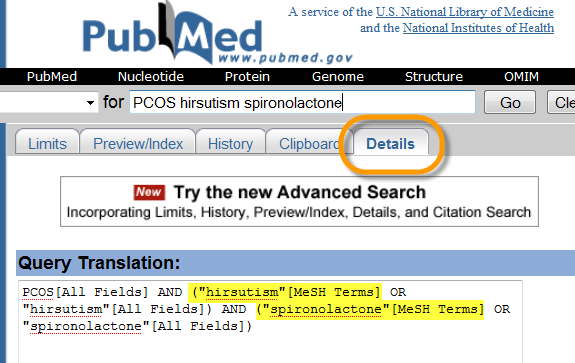 Tip 3: PubMed is just one NCBI-database. As you may infer from the official web address of PubMed: http://www.ncbi.nlm.nih.gov/, PubMed is (just) one of the (freely available) databases of NCBI (National Center for Biotechnology Information) . If you click on the NCBI-logo (in PubMed) you reach the Entrez cross-database search page. Most databases are particularly suited for genetics, genomics and proteomics. Several of the residents I know are also involved in research and may make ample use of GEO (gene expression database) and/or other databases. If you type for instance acute pancreatitis in the search bar, you see the hits per database, including the PubMed and MeSH database. In this case OMIM seems the most interesting of the genetic databases. OMIM is the “Online Mendelian Inheritance in Man” database. It contains full-text, referenced overviews with information on all known Mendelian disorders and over 12,000 genes and is intended for intended for use primarily by physicians and researchers. One of the recent alterations to PubMed is that you can just type the title in PubMed’s search bar to find a specific article. You can also type in other specifications or an entire reference. But it doesn’t always work. When you type Lancet acute pancreatitis you get too many papers (if you would look for a primary study) but if you copy the following reference from Google: Frossard JL, et al. Acute pancreatitis Lancet 2008; 371(9607) you will get zero results. This is because different Journals have different reference-styles (order, initials, punctuation) and people often make mistakes while citing. 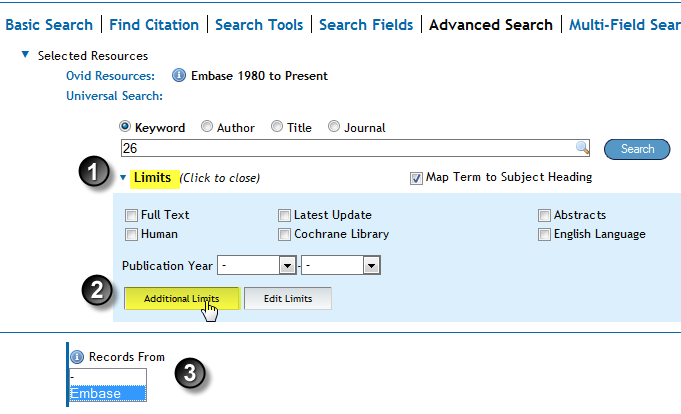 Another possibility, much loved by librarians because of its versatility, is the Single Citation Matcher in the blue side bar. # You can fill in any field you like and some fields like “author name” have an auto-fill function. 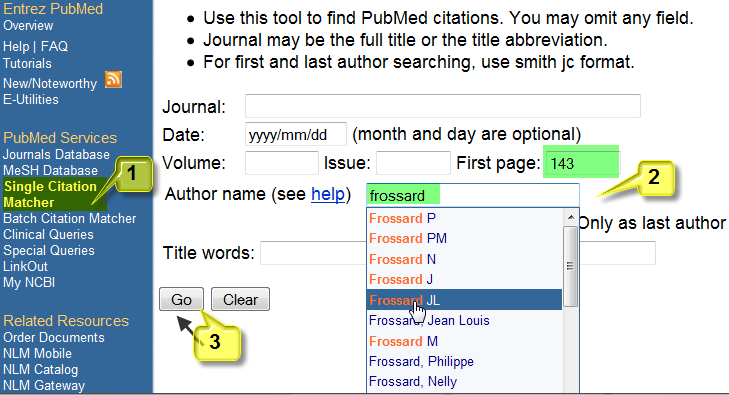 In this case I searched for the “Author name” Frossard JL (tick “only first author“) and the First page: 143. I get exactly 1 paper: the correct one. It is important for a doctor to keep up with the new developments in your field. There are ample possibilities in PubMed. One is RSS. A previous post descibes how it can be created in PubMed. Another possibility is MyNCBI. Old fashioned? Not at all. 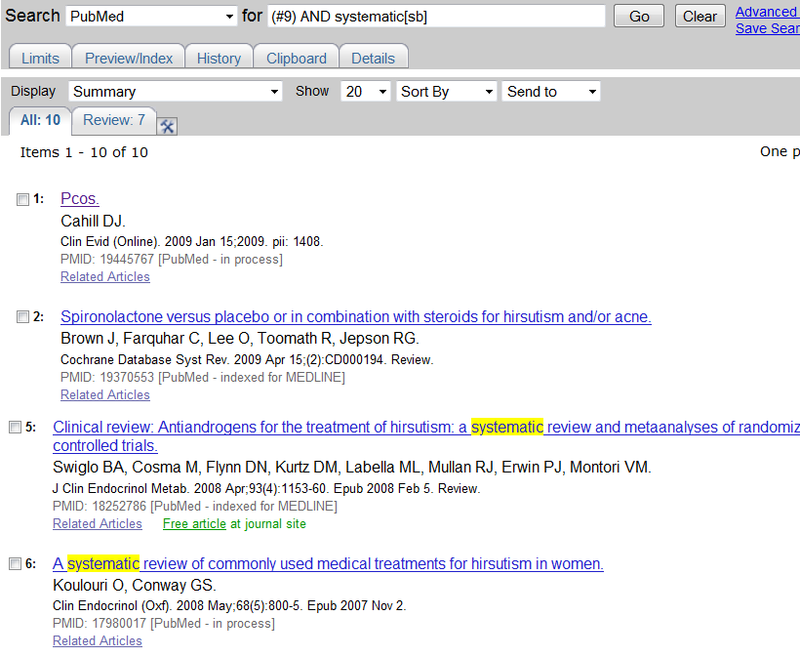 In PubMed, I find it more useful and easier than RSS. 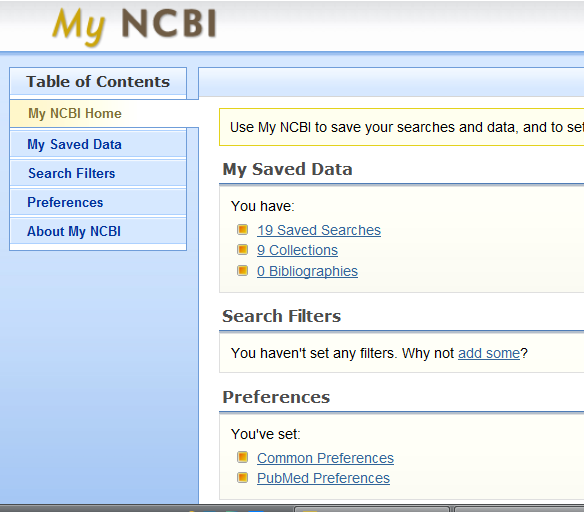 You can find MyNCBI at the upper right or in the blue side bar#. Searches can be saved, and executed/adapted at later timepoints or can be used to create an alert. Alerts can be mailed at any frequency you like. If searches overlap it is good to combine them, so you don’t read the same items twice (or more). Other possibilities are: “Save Collections” (individual articles), make filters (see Tip 1) and share them. A nice gadget: under preferences, you can activate a highlight function: When logged in, the terms you search for are highlighted in the desired colors. 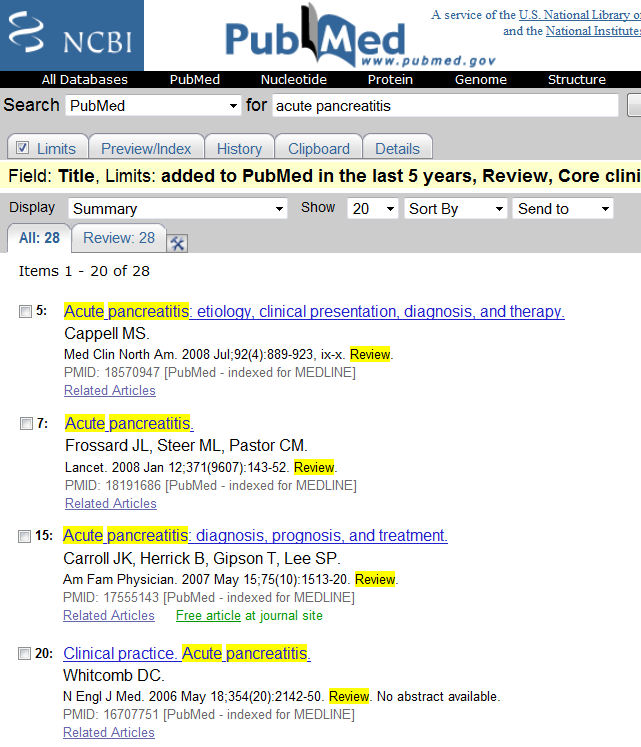 That’s why acute pancreatitis and review are highlighted yellow in the PubMed search shown above. O.k. this is something you may not want to give up, because you’re from the Internet generation and you’re used to intuitive interfaces and searching by trial and error. You’re used to just take a glance at the first few hits out of thousands of records ranked by “relevance” , that exactly match the terms you entered. This is not what you should aim for in PubMed: finding a paper because the authors use exactly the same words as you search for – and looking at the first few hits (there is no ranking in PubMed, hits are shown chronologically) do not necessarily mean it is the most relevant to you. It only matters if the study answers your question (for your particular patient), and if it is of good quality. Thus, don’t aim for wording similarities, aim to find the papers that provide you (and your particular patient) with the best answer. It depends on your question, but generally speaking it is not the best thing to type a whole sentence or the entire PICO in the search bar. Usually it is best to search per term and start with the most important term first and leave out the terms that do not really matter. So how would you search for the following question? 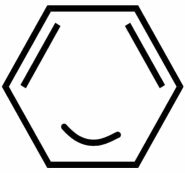 Does spironolactone (anti-androgenic) effectively reduce hirsutism in a female with PCOS? Is it safe and is it comparable to Cyproterone acetate? Some people type: PCOS hirsutism spironolactone treatment cyproterone acetate and add gender and age as well. This yields a few results which are on the topic, but yet you may miss the most relevant ones. A better way is to search for the two most important concepts: hirsutism AND spironolactone and to look for systematic reviews and RCT’s because these provide the best evidence (see TIP 9). If necessary PCOS can be added afterwards. Treatment is usually a superfluous term. It is (usually) better to look for RCT’s or -second best “cohort studies” (because these are the best study designs assessing effectiveness of interventions). Also take care not to apply unnecessary limits. Always ask yourself: is this word crucial? And does adding this word/limit reduce the chance that I find a relevant paper? Whether you use tip 6 or not, at the very least, check the translation of your search by clicking the Details Tab. Yes, your search is interpreted or ‘mapped’, didn’t you know? That is usually a good thing, because PubMed’s keywords (MeSH) are automatically found, if you use terms that PubMed considers as synonyms for certain MeSH. This can enhance your search, but sometimes the translation is either wrong or you didn’t use the correct word (according to PubMed). So if you check the search PCOS hirsutism spironolactone you will see that hirsutism and spironolactone are correctly mapped to a MeSH, whereas PCOS is not. Seeing this you must be alarmed, because it is very likely that there is a MeSH for such a common disease. The correct MeSH is polycystic ovary syndrome. But in this case you might as well leave PCOS from the search. By taking ONE second to check Details you become aware of wrong translations and can do something about it. Exclude the term or modify the search. Or you can see that the translation is ok and leave it like that. Tip 8: MeSH or textwords? There are people who merely use MeSH and people who swear by textwords. I use them both. MeSH are keywords, added by indexers to the record. It would be a pity if you would miss relevant MeSH-terms, because this will inevitably lead to missing relevant articles. MeSH are incredibly useful for finding a group of diseases. Suppose I would like to search for the usefulness of exercise to lessen fatigue in cancer patients (no matter which cancer). If I just type cancer in the search bar, this term is not only translated into the MeSH neoplasms, but it is also automatically exploded, which means that all narrower terms (terms lower in hierarchy) are also searched for. Thus papers are found whether they are indexed with neoplasms, lymphoma or breast neoplasms. On the other hand, if you use only MeSH you will miss new non-indexed papers or ‘wrongly’ indexed papers, while some terms may not even have an appropriate MeSH. Therefore I usually use both MeSH and free textwords. In the above example it is sufficient to search for hirsutism AND spironolactone. By checking “Details” you know you’re searching for the right MeSH as well. early ambulation[mh] OR immobilization[mh] OR early mobili* (* means that you truncate the term and find early mobilised/mobilized, moblisation(s) etc. =Note that when you use an asterisk there is no longer any mapping with the MeSH!!). When u search for the best evidence, Clinical Queries may be very handy. These are prefab search filters that aim to find the best evidence. It is best to first search aggregate evidence by using the systematic review filter, which is really much broader because it also searches for reviews of clinical trials, evidence-based medicine and guidelines. You only get 10 very relevant hits, including one synthesis of evidence in Clinical Evidence, several Cochrane Reviews and other systematic reviews. Since these are all very recent papers you may decide to stop here. If you like, you can check for individual trials as well by searching by Clinical Study Category (choose the default: therapy narrow and enter search #9 again). This gives 24 hits. One word of caution: Not all filters are that good. The Systematic Review Filter and the Narrow Therapy filter are quite good for a quick search though. Tip: you can adapt the filters yourselves. What do you think you search for if you type: hand OR arm AND foot? You probably mean to search for (hand or arm) AND foot, but Pubmed follows another logic, depending on the order of the words. In this case it puts (invisible) brackets round arm and foot, not hand or arm. Result: you find far more (irrelevant) articles, because you retrieve every(!) article using the word “hand” and a few extra with (arm and foot). You can keep it under control by placing the brackets yourselves. (when you don’t add operators PubMed uses the AND-operator, thus #8 #9 means #8 AND #9). 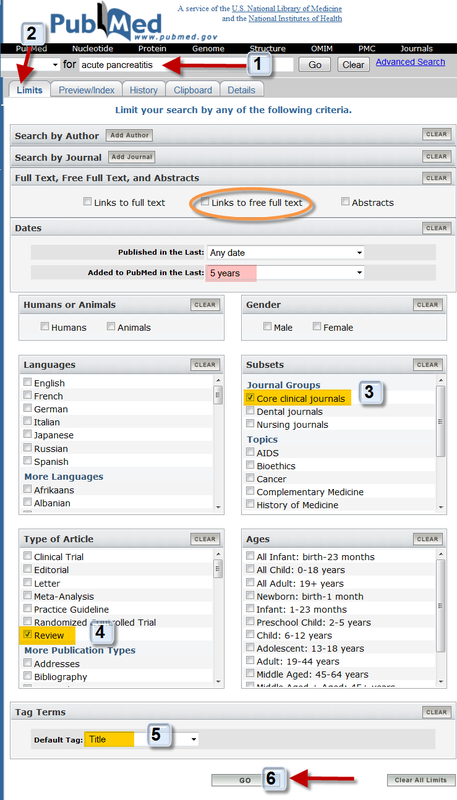 You can add another term to the search as well, or apply a clinical query or limit. The final search you can save in MyNCBI. It shows the search with the appropriate brackets when you execute it. Besides OR (synonyms) and AND (narrowing) you have the boolean operator NOT. Please, generally do not use NOT to get rid of articles that are irrelevant, but rather try to select positively. Why? Because by using NOT you might exclude relevant articles. Suppose you want to find articles about nosebleeds in children by using NOT adults. Then you also exclude articles about adults AND children. NOT can be very handy however to subtract searches from each other. Suppose you have screened 100 articles (#1) and you get a brilliant idea using another word, which gives set #5. You can go through 120 articles, but you can also subtract the two searches from each other: #5 NOT #1 : and you only have to check 20 instead of 12o records. As an extra tip, this final and probably most useful tip. Follow library courses if you didn’t do so already during our internship, ask your librarian to help setting up a search for an automatic alert and to deduplicate results from different databases (i.e. MEDLINE and EMBASE) and ask the help of your librarian if you want to perform exhaustive or difficult searches or if you just want some advice. It is no shame to go to your librarian. We’re there for you. Thanks for a very interesting post. I have asked you some questions via twitter and will put your replies in a comment if you get time to answer! PS I learned quite a bit! 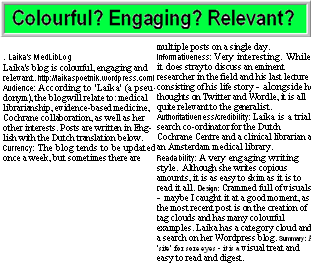 Laika, Thanks for a great description of how (and why) to search Medline – it is an instant classic which I wrote about on the EBM blog today. Laika, the problem w/ the hand or arm and foot search is that you didn’t capitalize the booleans. When I search hand OR arm AND foot, it nests the OR, and I get 13,464. When I search hand or arm and foot, I get 264,027. If you capitalize the booleans, Entrez interprets your search as straight left to right. You’re correct Erika, capitalization is another thing one should not forget in some databases and in this example that matters. However, the order of the terms can still influence the outcome (if it is not between brackets). foot AND (hand OR arm). Really useful! Thanks a lot. thanks for the blog! Let me point out that GoPubMed (thx 4 mentioning it) is – like you said – a semantic front end to PubMed. So we show in this show case all PubMed features and in addition the tree (the WHAT, WHO, WHERE and WHEN ontology, semantic net) containing of Gene Ontology and MeSH. This is made to demonstrate the power of semantic search. Our customers use their own ontologies and their own text (e.g. from the intranet). I’d highly appreciate if you do have critics, let me know! We are about to release a new version next Monday. Stay tuned! This will be a major step towards true semantics. Thanks for sharing this tips! I will cite you in my blog because I think this is helpful and very interesting! !